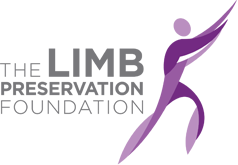 The Limb Preservation Foundation is a proud partner of the ColoradoGives organization, which saves The Foundation credit card processing fees. 100% of your online donation will go directly to The Limb Preservation Foundation. Your donation supports patients just like Erin! 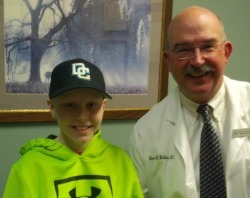 Erin celebrates with Dr. Wilkins at the end of treatment! Erin was diagnosed with osteosarcoma of her tibia in June 2013. Her medical team at the Denver Clinic of Extremities at Risk at Presbyterian Medical Center consisted of oncologist, Dr. Jennifer Clark and orthopedic surgeon, Dr. Ross Wilkins, along with a supporting multi-disciplinary team of medical professionals including plastic surgeons, vascular and infectious specialist, radiologists, pathologists and physical therapist. Her eight month treatment included chemotherapy before surgery to shrink the mass, a complex limb salvage surgery, followed by post surgery chemotherapy. The Limb Preservation Foundation joined the team by providing assistance to the family with their travel and lodging costs between Dodge City, Kansas and Denver, Colorado. Erin has also benefited by the advancing osteosarcoma research and treatments funded by The Limb Preservation Foundation that have increased the survival rate of cancer patients.